How To Identify Squash—Different Squash Types You Didn't Know About! 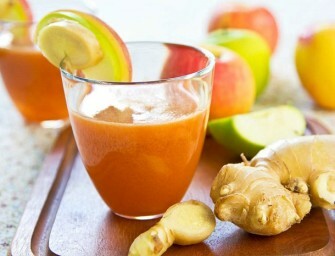 Nature has showered us with a variety of fruits and vegetables which we merge with our creativity and foody instinct. We have labelled almost all the edible ones we know with different names and even placed them into categories depending on their similarities and differences. We have a variety of the same vegetable or fruit which take a new form in accordance with the season or environment, the climate or the soil. 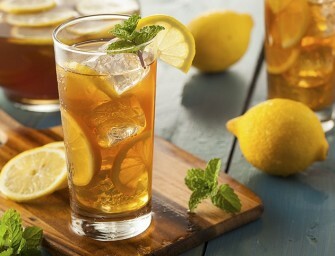 There is one vegetable which has one of the highest varieties and is classified into the summer and the winter type. This versatility rests with squash. Yes! This veggie is available in multiple shapes and colours, which also differ in taste. The summer and winter forms do not actually mean the seasonal type but it is purely based on the perishability of this green. 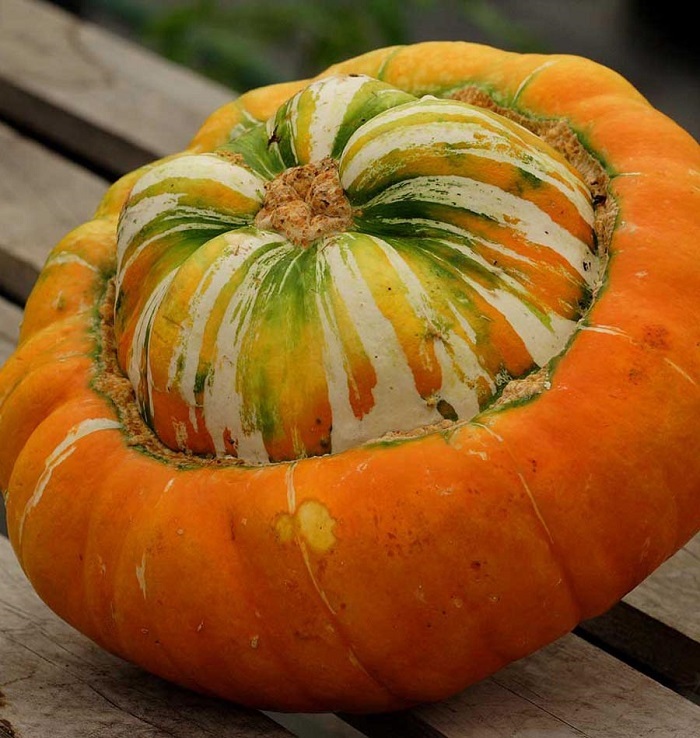 The ones which have harder skin and seeds are more durable than the ones with thinner peel, and as such they have been termed as winter squash. Do not be surprised if you come across a winter squash in summers as both the variations are found round the year. After reading this article, you will have an idea as to which squash can be stored for a longer period and which are the ones which we cannot. 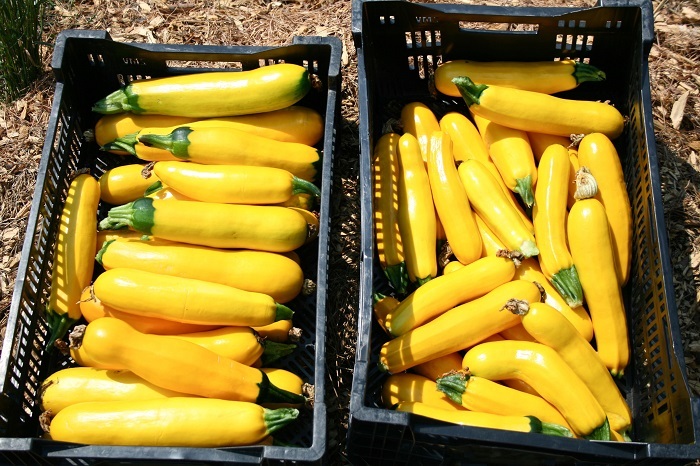 Summer squash can be kept for one or two weeks whereas, when taken care of, winter squash can be used for months. Among the different varieties, these are a few popular ones which we might have seen in the market but did not know that it belonged to the squash family. 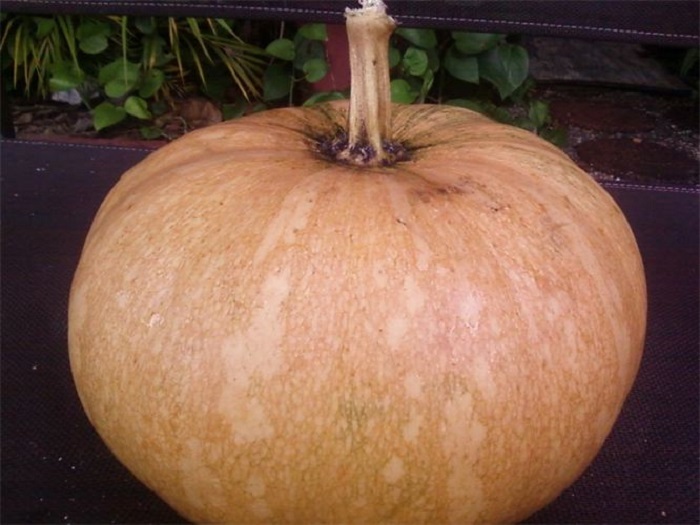 This winter squash type is known in New Zealand and Australia as Japanese pumpkin. This has a number of varieties such as Cutie, Emiguri, Ajihei, Miyako and Ebisu. Kabocha has a dark green coloured skin and has a shape similar to a pumpkin. The peel is hard and inside it is orange-yellow. 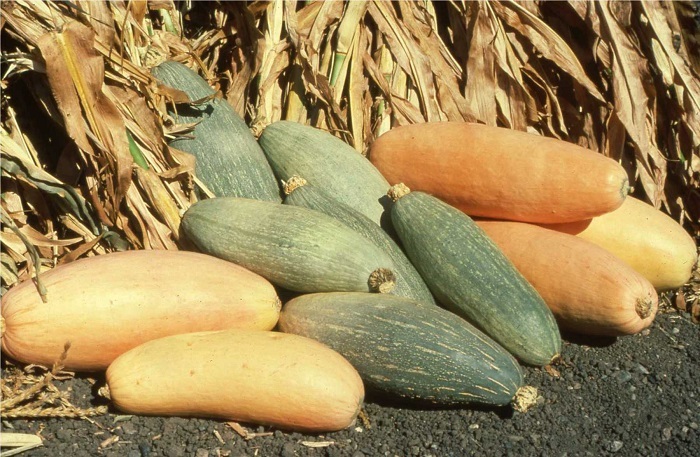 In colour and texture, it is similar to kabocha, but its shape is elongated. Acorn squash is known by different names as Des Moines squash or pepper squash. The ridges are distinct and even though it is a winter squash, it has similarities to the summer squash variety. 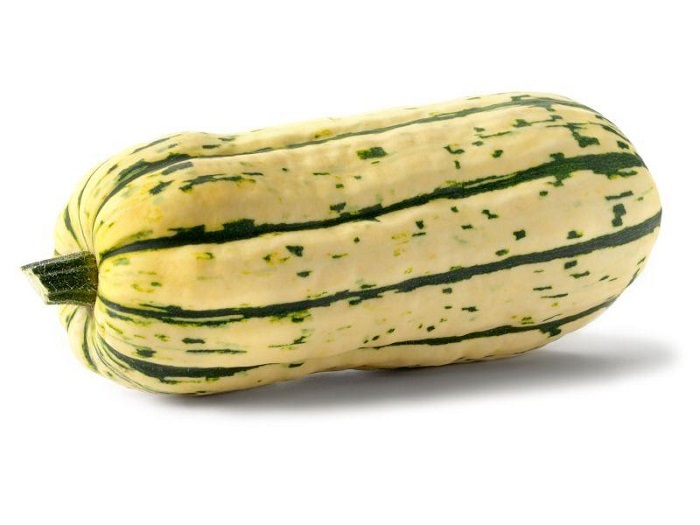 The Delicata squash has a tender skin and probably this is the reason behind the name. It has a creamy colour skin with green striped lines along the ridges. Because of the delicate skin this is hard to store for a long time and even in the exportation is also not feasible. Also known as Bohemian squash, peanut squash and sweet potato squash, this used in cooking and resembles the summer squash, even though it is eaten as a winter one. This vegetable is associated with pumpkin as it tastes like it and is even known as butternut pumpkin in New Zealand and Australia. The interior is orange and the outer cover looks rough yellow, which darkens as it grows. 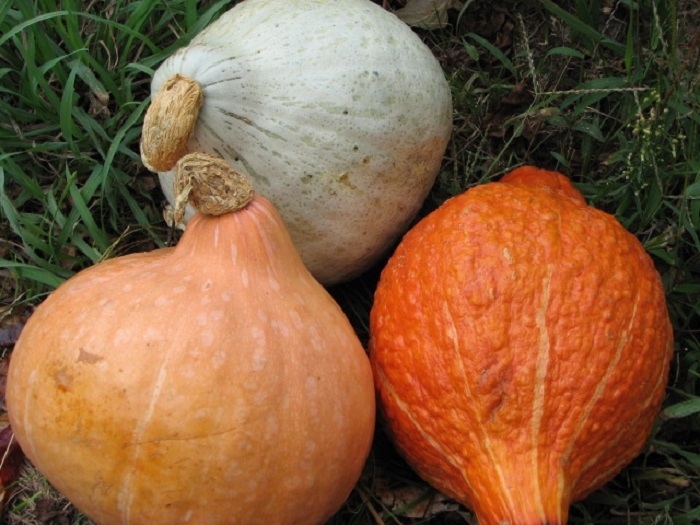 It tastes sweet and one of its most renowned types is the Waltham Butternut. 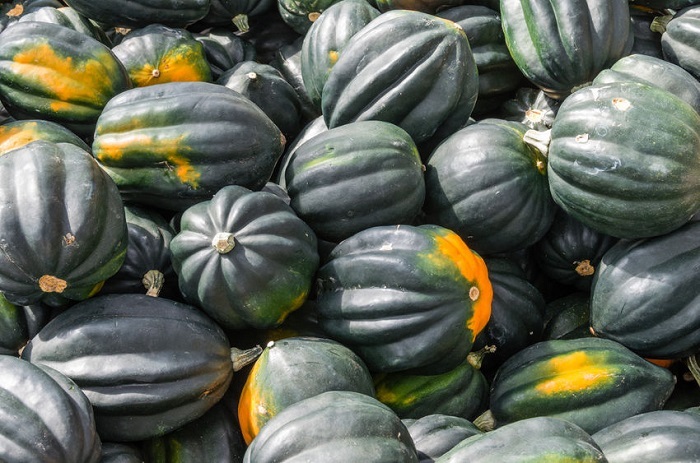 Hubbard squash can be used as pie stuffing or in soups and has a wide range of vibrant rind colours like orange and gray, and within it is yellow. This winter squash can have a durability of around 6-months if stored well. It weighs between 8 to 20 pounds and owing to its huge quantity, it is sold in cut pieces. 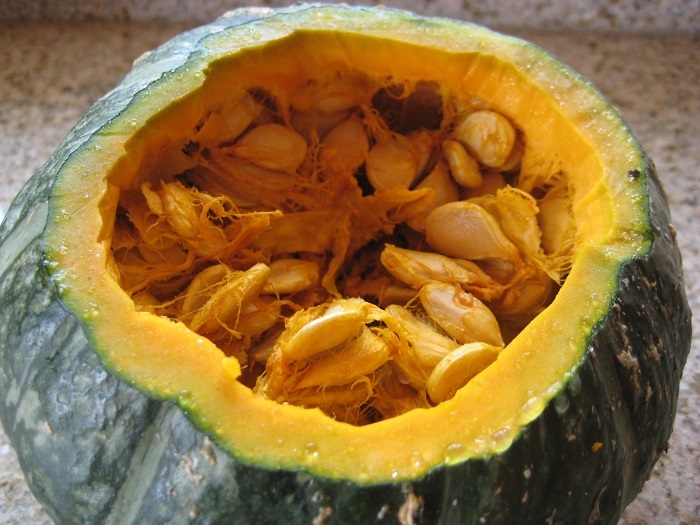 The Calabaza squash is also known as the West Indian pumpkin and this is cultivated in America and West Indies. However, due to its hard skin, it is transported to different places as it can be stored for longer than the ones with thinner skin. This is available in the market in cut pieces, but once cut, like any other fruit it spoils within a few days if not consumed. 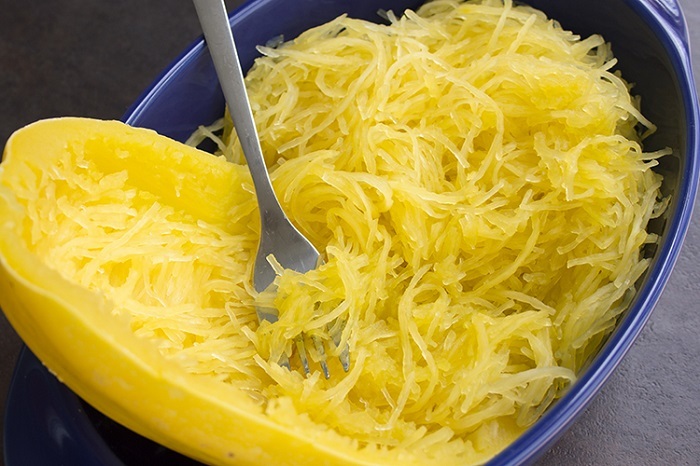 The name comes from the fact that this squash splits into strands like that of spaghetti. This cylindrical shiny yellow squash weighs from 4 to 8 pounds and is used in pasta or savored by adding herbs and butter. It is also termed as vegetable spaghetti, noodle squash or vegetable marrow. Glistening yellow inside and bright coloured peel ranging from green to white to orange, this squash has a typical shape which helped it in acquiring this name. This squash has a big cap which can be removed in order to make it into a pot to hold soup and the like. Gold Nugget or oriental pumpkin is a smaller version of pumpkin and it weighs between 1 to 3 pounds. This orangey squash can be cooked, cut into pieces or even prepared whole. This pumpkin look alike is also consumed by baking. The Carnival squash tastes like butternut squash and sweet potato and is eaten by removing the peel. 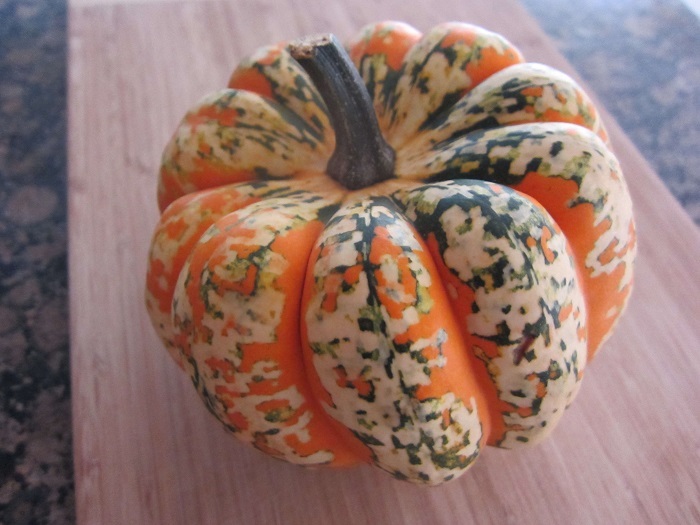 The hard skin of this winter squash is deep green in colour with light green and orange marks. This vegetable is used in soups or consumed by baking or steaming. This too looks like a little pumpkin with dark orange skin as well as flesh. 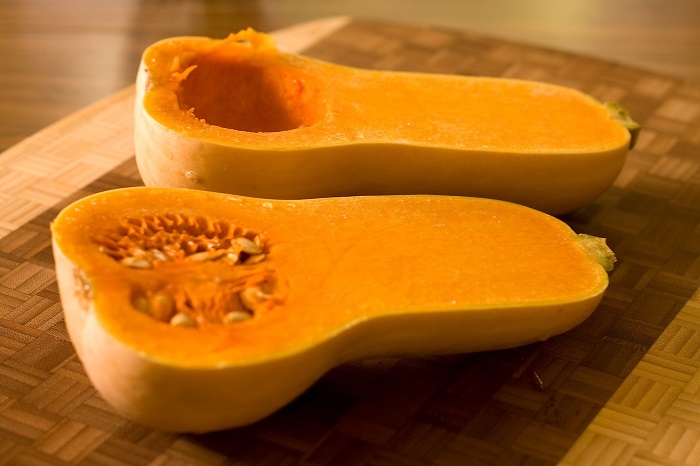 It can be roasted by cutting into cubes and being a winter squash is storable for a long time. The flesh is not mushy and has a sweet taste. The Banana squash belongs to the Cucurbita maxima species like hubbard and buttercup squash. Its peel colour varies from orange, pink and light blue and the inside is a peculiar shade of orange. It has a long structure and can be used to make pie and even soup. 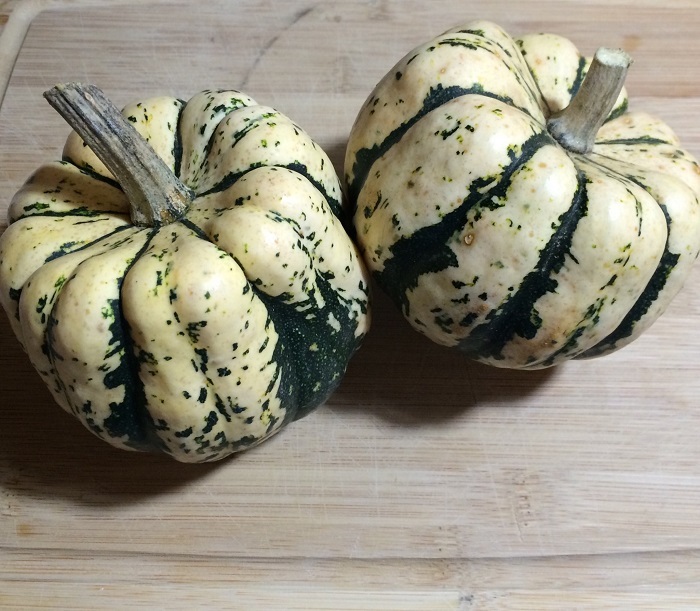 This small squash has a skin coated with cream colour and the ridges are dark green. It looks like a pumpkin but is pressed on the top which gives it a distinct shape. The flesh greenish to orange in colour, has slightly sweet taste and is also soft. This squash is good for baking as it is small in size and can be cooked whole. 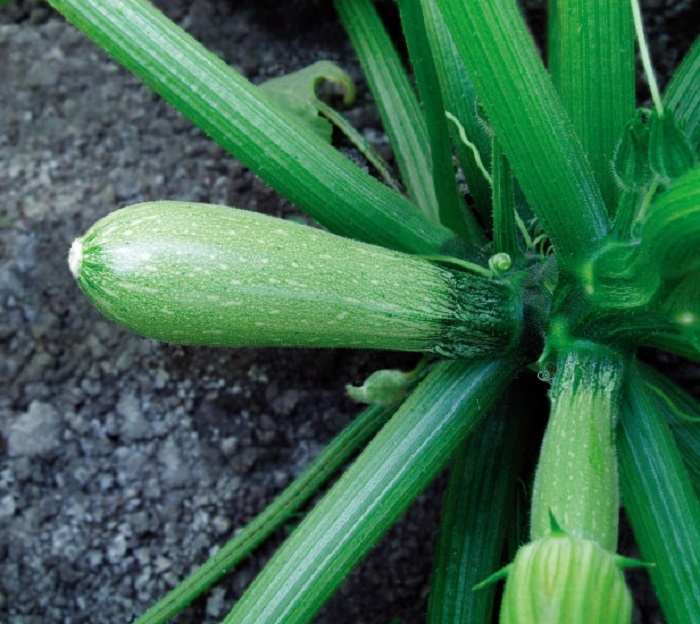 This tiny squash variety is a form of zucchini squash and it is preferably eaten young. When they become matured they can be used as vessels or pots, by taking out the seeds, to hold dips and other food items. 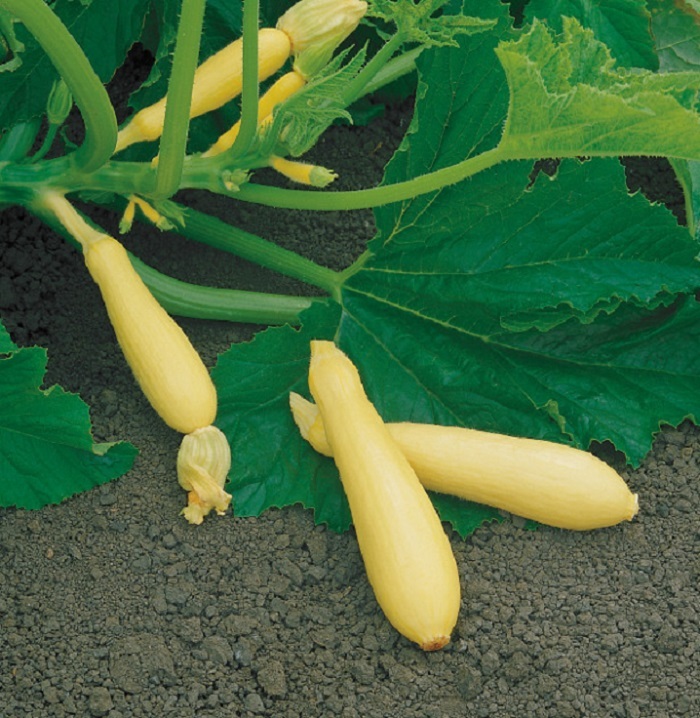 Gold Rush squash has elongated structure, and the skin looks velvety with its golden yellow colour. This summer squash has tender peel and flesh, and even the seeds are soft like that of zucchini. The flesh is white and the green stem looks great along with the shiny yellow body. This summer squash has a waxy skin which is light yellow and the flesh is white. 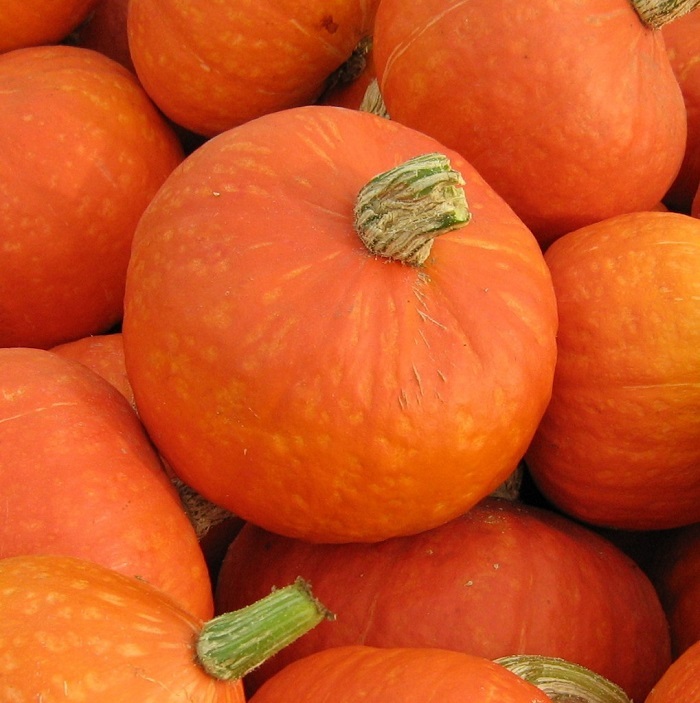 Fortune squash has a slim body with a thinner neck and it grows in huge quantities in the vines. 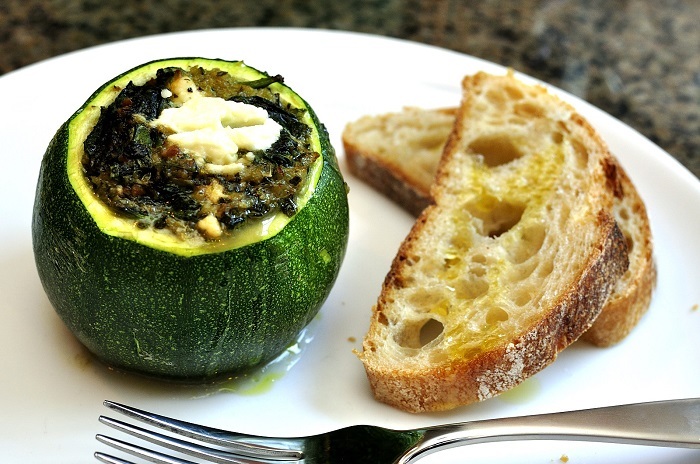 Cuarzo squash is a summer squash with greyish green skin and looks like the zucchini squash. This is much popular as it grows in plenty and because it can resist diseases, this vegetable allows longer cultivation period. The parador vine produces squash which are have a velvety yellow colour with small ridges and tilted neck. This summer squash grows fast and they are a treat to the eyes as well as the tongue. 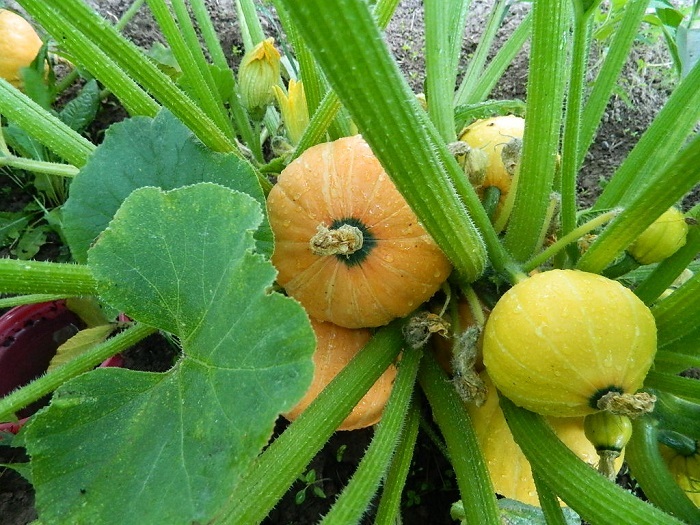 The Sunburst squash or patty pan squash are small and look ornamental with their flowery structure. 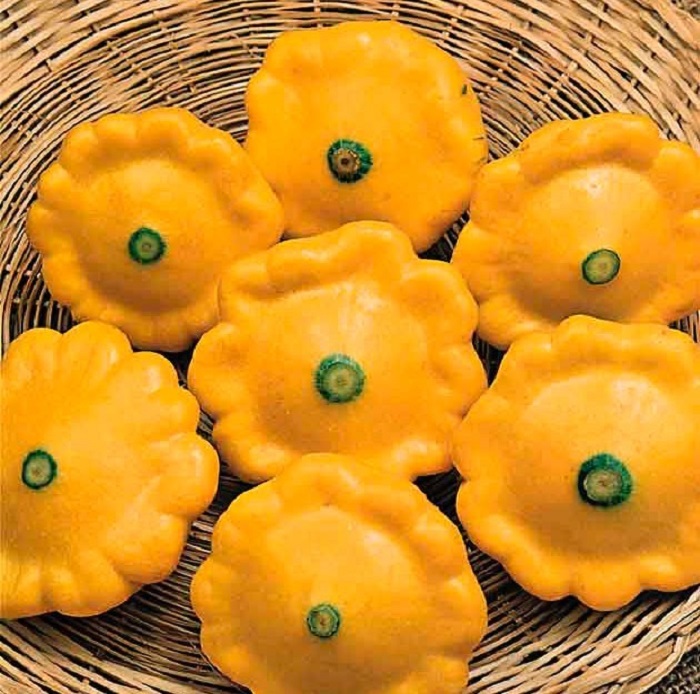 The sunburst patty pan comes in bright sunny colour as the name suggests and having a buttery taste, it fits into any summer dish. Patty pan squash is also found in light green colour which is also known as white squash. 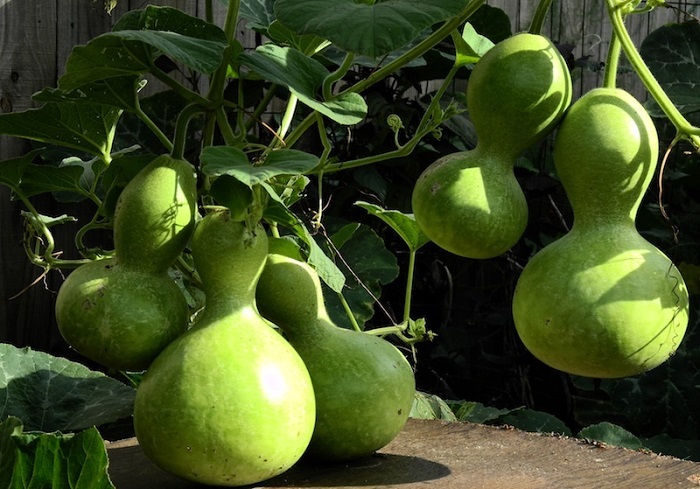 This has a unique shape and accordingly it is also known as bottle gourd. Calabash has culinary uses when it is young and after it matures, it has a variety of uses like that of a vessel or bottle or pipe. 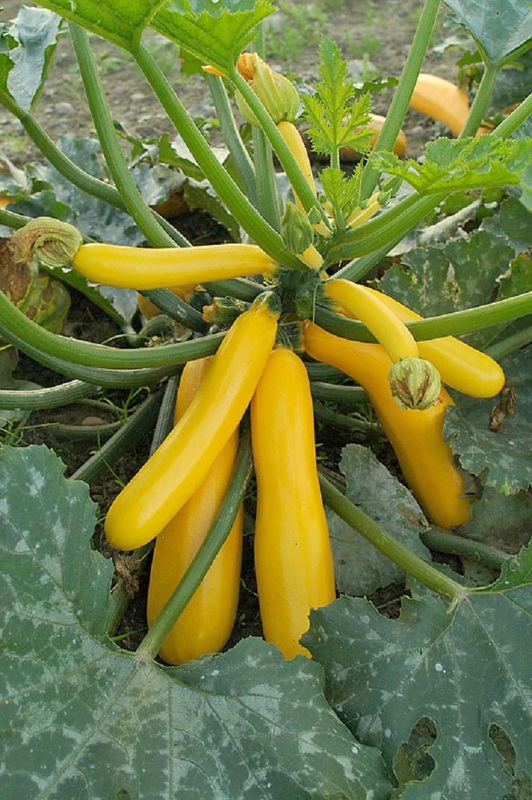 This summer squash has light green skin and ivory white flesh and grows in a climber plant. Among other names, they are also known as long melon or opo squash. Top 20 High Protein Foods That Will Make You Feel Healthier! !